Yesterday, 11th June 2013, Twitter officially closed its V1.0 API and have migrated to v1.1 API now. This means that we need to authenticate users before being able to display tweets from a user’s profile, even it is a public profile. Yes, you read it correct even if the user’s profile is a public profile. This means that to get tweets from any Twitter user’s timeline, we will need to make an authenticated request via oAuth. In case you want to know what oAuth is all about, read it here. This post will explain you how to authenticate your website / application to display tweets from your timeline. 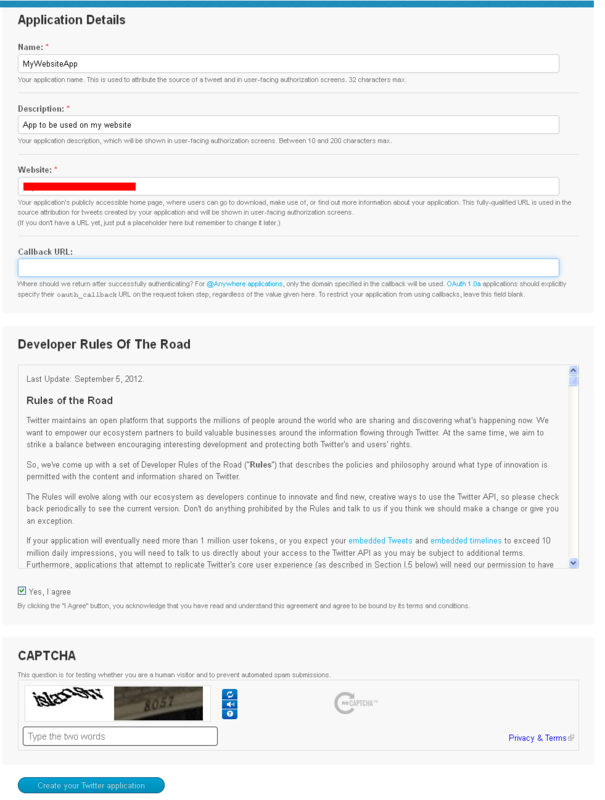 In case you are just interested in displaying tweets from your timeline on your website and nothing much, you do not need to dig into this post, rather you can do it using Twitter Widgets as explained here and if you are not happy with the way it looks on your website and you want to customize it, read this article on customizing the embedded widget. Connect with the App using a library in language of your choice. 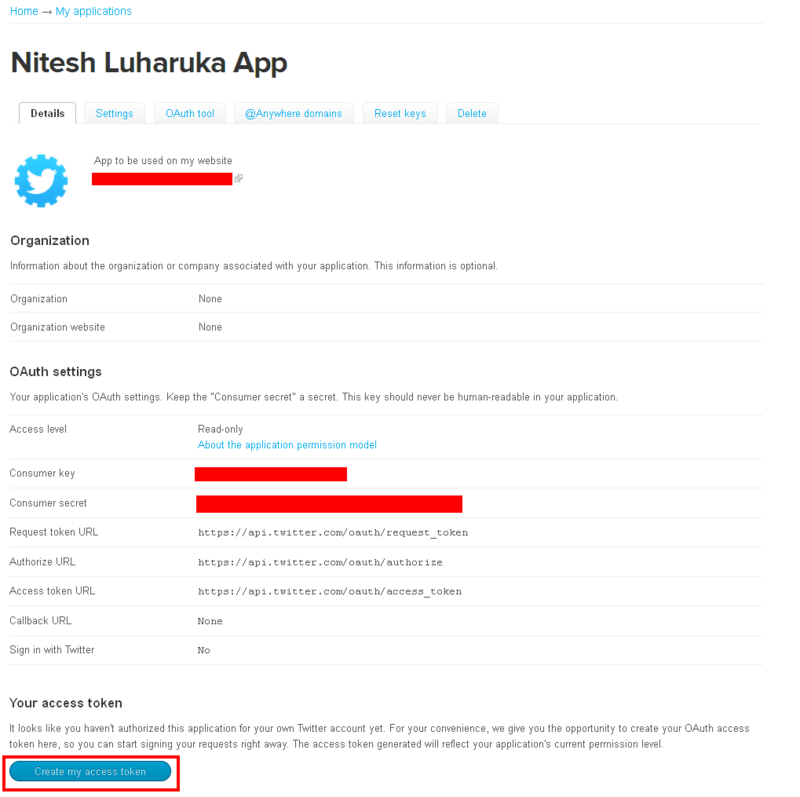 Hit “Create your Twitter Application“. You will see a message that your app has been created successfully and you will see you Consumer Key and Consumer Secret. At the bottom of the page. Click “Create my access token“. You will see a message that your token has been successfully created. 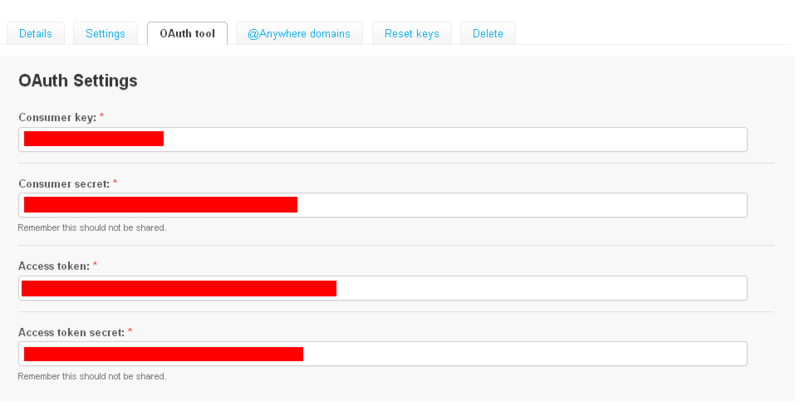 Once this is done, go to “OAuth Tool” tab of your app and copy the following fields to be used in your application. You are ready to code some lines in your application to get data from your timeline. Will be coming up with another post to allow you to connect data with different libraries. In case you face any issue with this, contact me via comments or social media.